Below are more highlights of the strike-shortened 1981 season, including year-end honors, the first black manager in the National League, and the year's Hall of Fame inductees. Boston's Carney Lansford wins the American League bat crown at .336. Pirate Bill Madlock barely qualifies for the BA crown, winning at .341. Nolan Ryan has the best ERA in the majors (1.69). Tom Seaver leads National League with 14 wins and .875 win pct. Oakland, managed by Billy Martin, plays in a manner that is labeled "Billy Ball" and finishes with the best record in the American League (64-45). Martin sets a major league record for most franchises managed to a division title (four). Hall of Fame inducts Bob Gibson, Johnny Mize, and Rube Foster. Fernando Valenzuela is the third consecutive Dodgers pitcher to win National League Rookie of the Year honor. Ranger Jim Sundberg wins the last of six consecutive Gold Gloves awarded to American League catchers. Oakland outfielder Rickey Henderson wins his only Gold Glove to date. Yankees send Willie McGee to St. Louis for Bob Sykes. Boston trades Fred Lynn and Steve Renko to California for Frank Tanana, Joe Rudi, and Jim Dorsey. Cincinnati swaps Ray Knight for Houston's Cesar Cedeno. Detroit sends Steve Kemp to White Sox for Chet Lemon. St. Louis deals Tony Scott to Houston for Joaquin Andujar. Mets trade Jeff Reardon and Dan Norman to Expos for Ellis Valentine. St. Louis Cardinals in 1981. 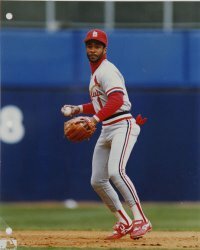 St. Louis deals Garry Templeton to San Diego for Ozzie Smith. The Carpenter family sells the Phillies. George Argyros buys control of the Mariners. The Astros allow a major league record-low 2.08 runs per game at home. Houston's Art Howe hits in 23 consecutive games to set Astros team record. Former Astros GM Tal Smith hired by several owners to advise them in an escalating number of salary arbitrations. Giants' Vida Blue is the first to be an All-Star Game winning pitcher in both leagues. Mike Schmidt's .644 SA is a record high for National League third basemen. Ranger Bill Stein sets an American League record with seven consecutive pinch hits. Ranger Buddy Bell makes a modern major league record 2.93 assists per game by a third baseman. Giants' Frank Robinson is the first black manager in National League. Chicago's Bill Buckner tops National League in doubles (35). Padre Gene Richards and Astro Craig Reynolds compete for the National League lead in triples with 12. Henderson leads American League in swipes (56), hits (135), and runs (89). Milwaukee's Cecil Cooper tops American League with 35 doubles. Eddie Murray, Oakland's Tony Armas, California's Bobby Grich, and Boston's Dwight Evans all tie for American League homer crown with 22. Murray tops American League in RBI (78). Grich leads American League in SA (.543). Evans tops American League in walks (85) and runs produced (133). Cleveland's Mike Hargrove leads American League in OBP (.432). Oakland's Steve McCatty wins American League ERA crown (2.32). KC's Dennis Leonard tops the major league with 202 innings. Barker leads American League in strikeouts with just 127. Oakland's Rick Langford leads the major league with 18 CGs. Rollie Fingers tops the major league with 28 saves. Cardinal Bruce Sutter's 25 saves are tops in the National League. Seattle's Tom Paciorek is runner-up for American League bat crown (.326) and also stands high in several other offensive departments. Every team in the American League East finishes above .500 except last-place Blue Jays, who have the worst record in majors (37-69). No pitcher in American League has more than four shutouts. Minnesota's John Castino leads American League in triples with just nine.